Share your results on Flickr in the group Mini Kaleids, KrazyDad Style. Instructions: Find an image you like on the Internet, and paste in the image URL here, then press the load button. Note: it is not enough to use the URL of the page the image is on, you must provide the URL of the image itself (typically ending with .jpg, .gif or .png). You can upload your own photos to an image-hosting site, such as imgur.com. Once your image is loaded, you can make the kaleidoscope move by clicking and dragging on the image with the mouse. When you mouse over the image, a faded version of it will appear. Click and drag the mouse to reposition the image. The 5-way, 7-way, and 11-way buttons on the upper left will change the mirror aperture from wide to narrow. The JPEG button will create a JPEG version of the image that you can download. It will take a few seconds to generate the image. NEW: The FEED button will take your current kaleidoscope image, and feed it back in as a new image, creating a feedback effect. The flower and cereal icons will load in some preset images I've prepared. 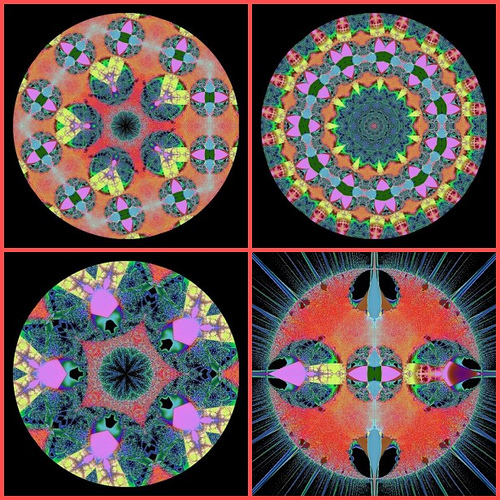 Fans of Kaleidoscopic imagery may want to consider joining the Brewster Kaleidoscope Society, which has an excellent website and quarterly newsletter full of information about kaleidoscopes, and kaleidoscope builders.